As you can see, it did not run as far as Washington in 1979. 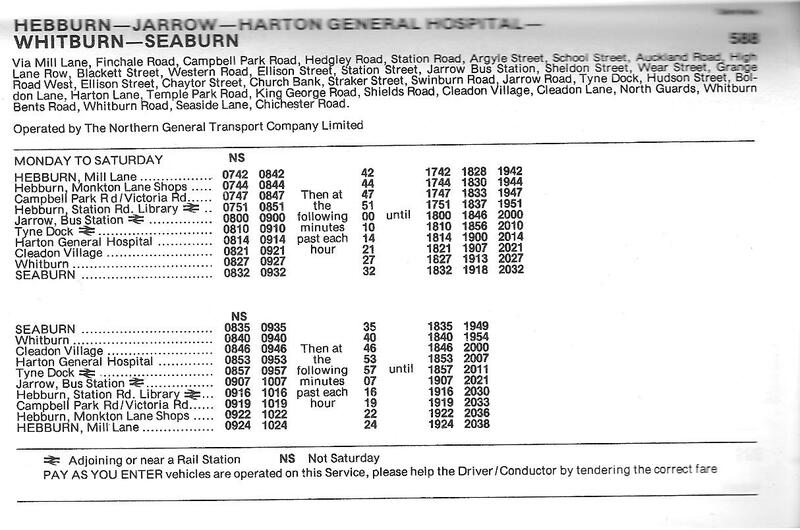 By 1985 the service had disappeared completely, presumably absorbed into the 540/541 services which ran between Monkton Lane – Jarrow – Harton Hospital – Seaburn (540)/Horsley Hill (541). If anyone has more information about the 588 service, then please feel free to post a comment. 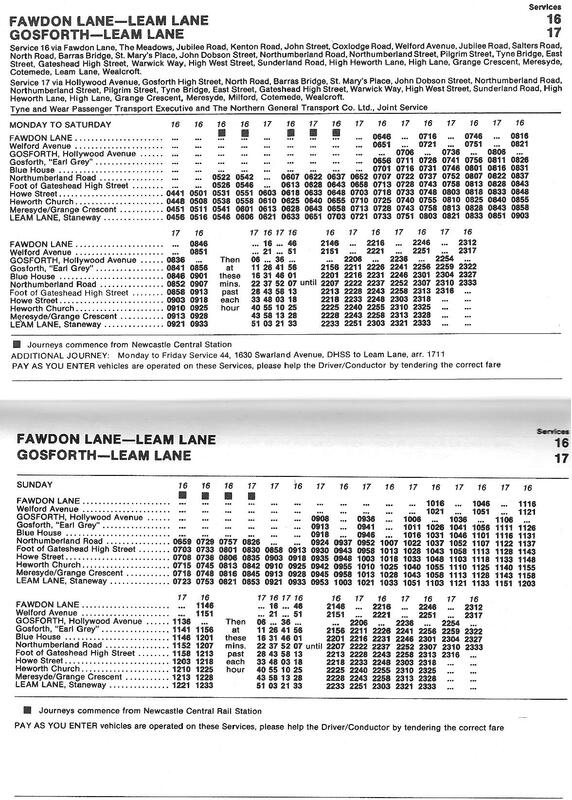 As I don’t really update this blog that much now, I would like to take the opportunity to make you aware of another site which makes these old timetables available to view. North East Buses (link: http://www.northeastbuses.co.uk ) is an enthusiast site which encourages debate about not only buses, but all forms of public transport, past and present, in the North East of England. Unlike other bus enthusiast groups/sites, this is open for anyone to view and contribute. 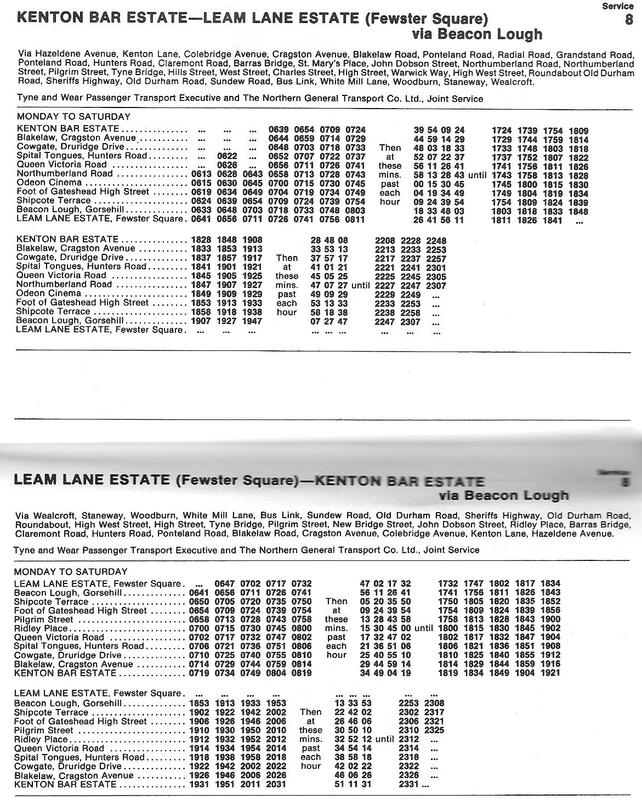 The forum contains a section called ‘The Bygone Era’ where, upon joining, a vast array of old timetables are available to peruse and download. Check it out!! This service has never really changed with one exception. In 1979, it was operated jointly by United and Tyne & Wear PTE. United Automobile Services (now Arriva North East) once ran a few services through the western suburbs of Newcastle and that is the theme for the next few posts. 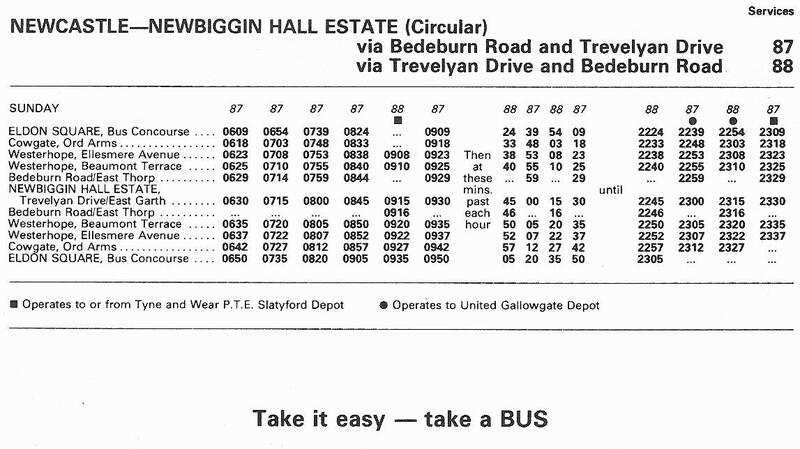 We begin with the 82 & 83, two services that were later replaced by the Tyne & Wear PTE/Blue Bus Services/Newcastle Busways operated X82/X83 services, then amalgamated into the singular X82 route that is currently operated by Stagecoach Newcastle between Throckley and Newcastle. 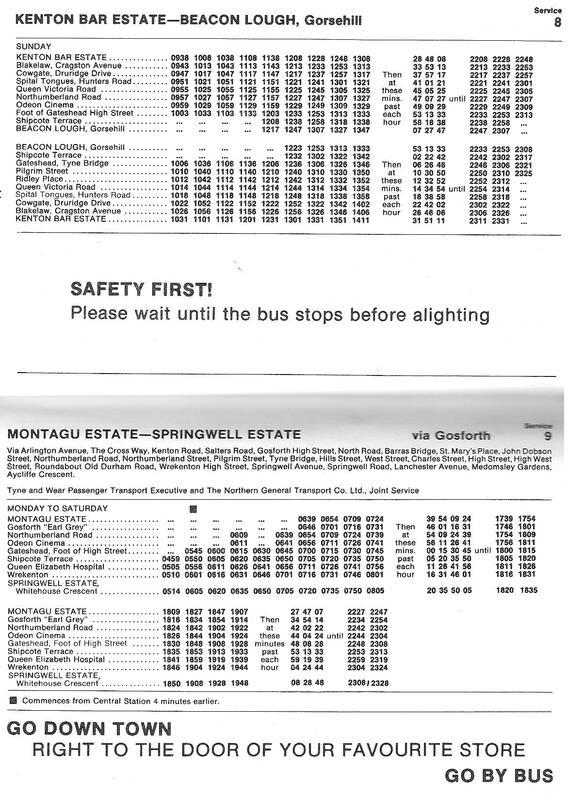 One noticeable change to this service is that it once terminated/started from Marlborough Crescent Bus Station. Now it operates direct from Eldon Square Bus Concourse which is more convenient for shoppers as opposed to a now demolished bus station near a busy train station which, at the time, would have been better for transport links. Another change is the curtailment of services to Throckley. 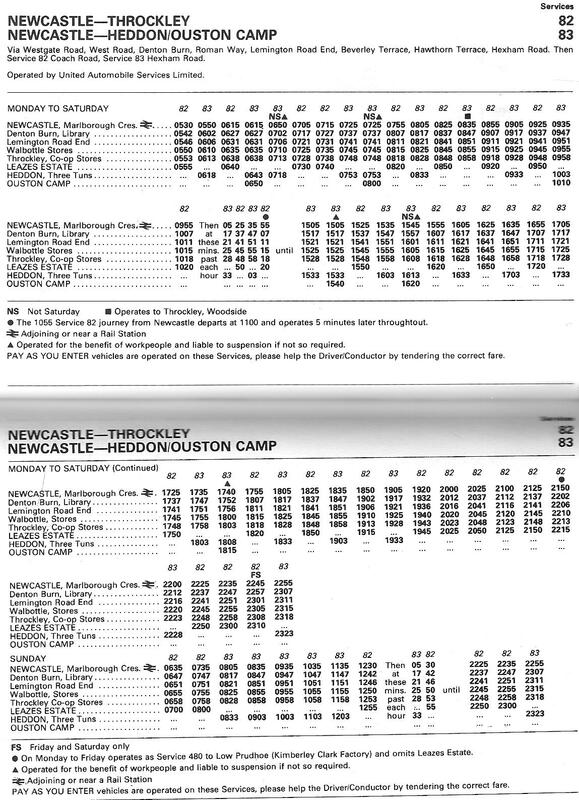 Heddon is still still served a a couple of long-distance services but Ouston Camp (also known as Albemarle Barracks) does not have a bus service anymore. I guess if you’re a squaddie there now, a car is essential. 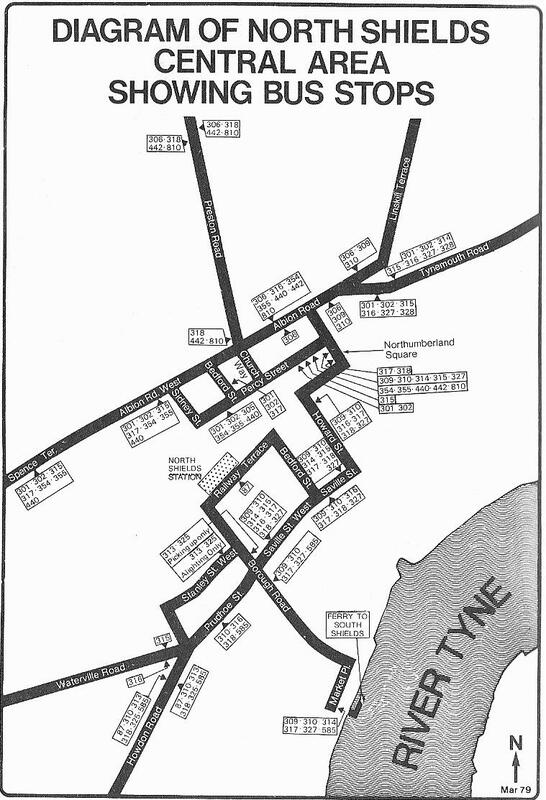 TWPTE (1979): Diagrams of Where Buses Stop in Gateshead, Newcastle, North Shields, South Shields and Sunderland. I think the title is pretty self-explanatory. See how it compares to now. In Gateshead, there’s no Interchange yet and West Street is a bi-directional as is The High Level Bridge. Sunderland has changed somewhat in recent years but other than that, things are more or less the same as they are now. 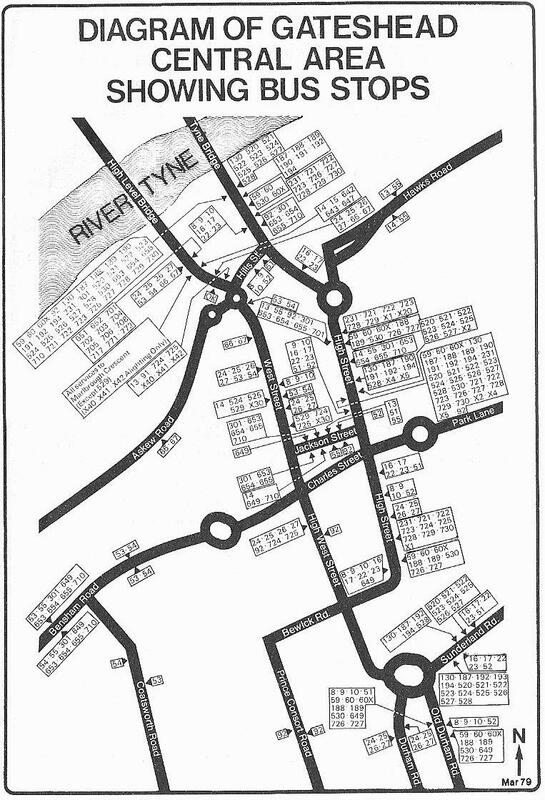 The last example of the Newcastle/Gateshead inter-urban services. 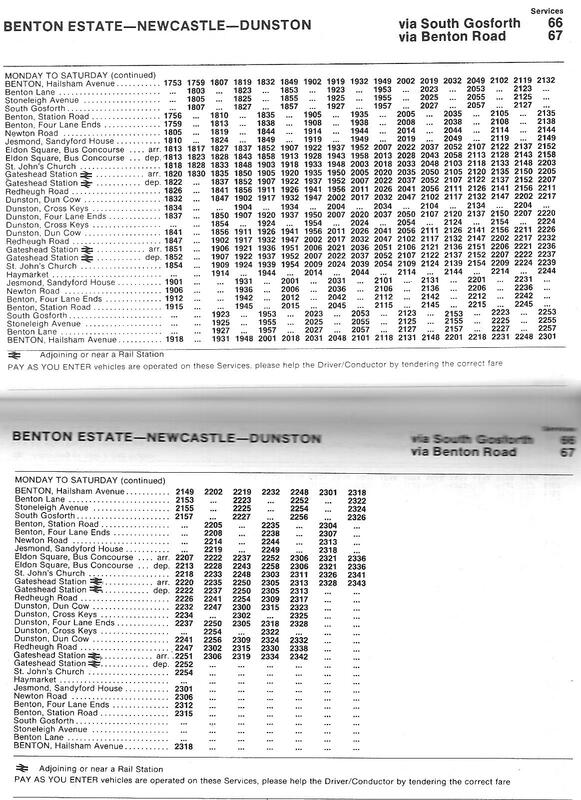 The 66/67 ran between Benton Estate into Newcastle, across to Gateshead, then operated the Dunston Loop. 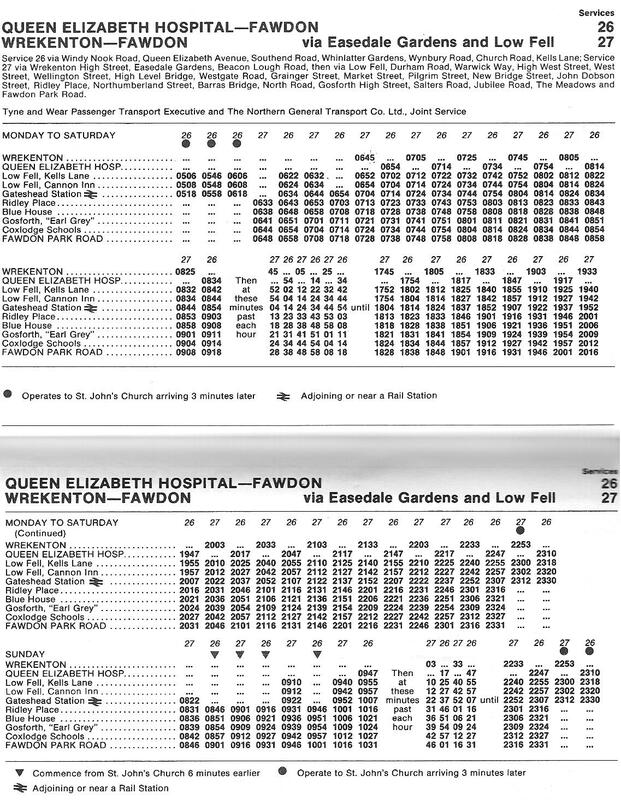 The Dunston Loop or Circular has had a few different numbered services operating it. 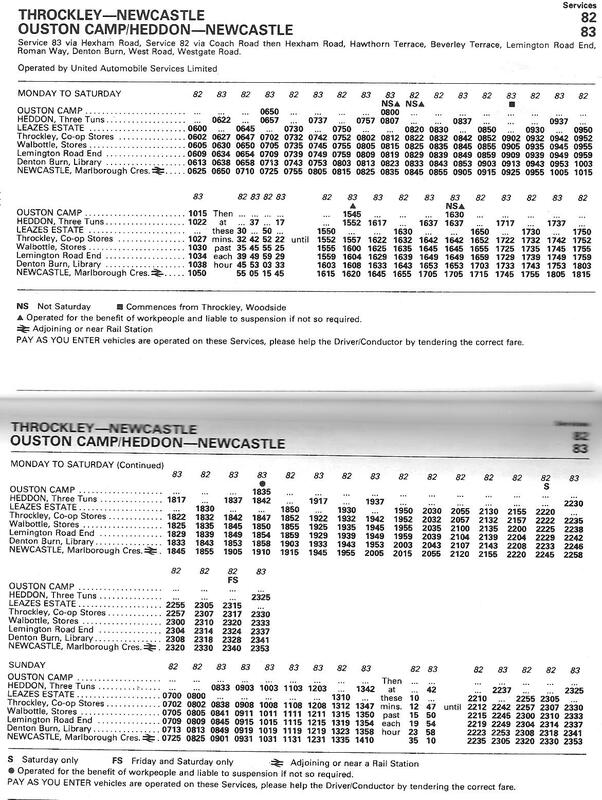 After the 66/67, it was the 58/59, then the 67/68, and finally the 64/65 (with an added 164/165 variation of it) before being absorbed into services that operated in the West of Gateshead. 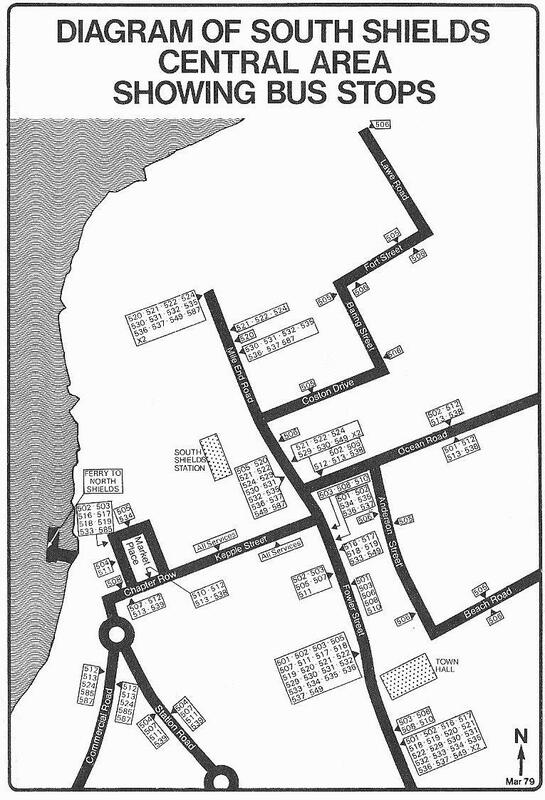 I believe that nowadays it has been amalgamated into the 49/49A/49B/49C set of services as well as the 95/95A. 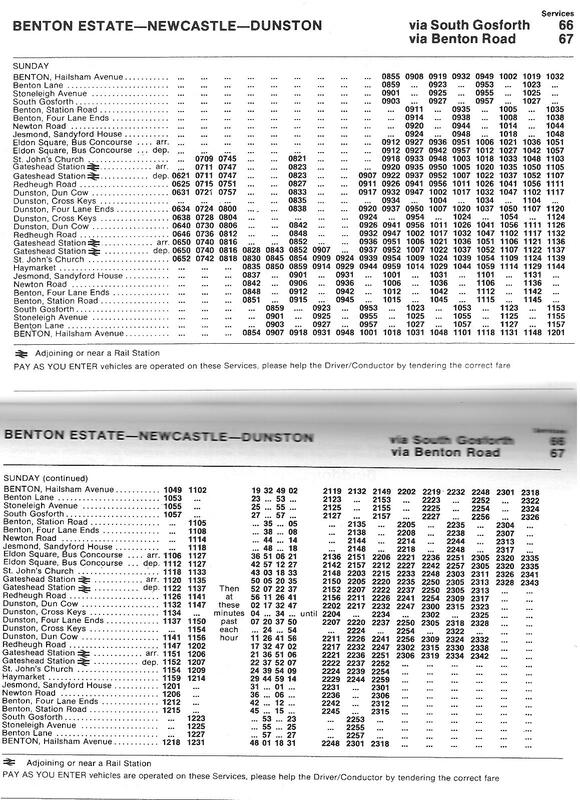 Here are the timetables for the 26/27 bus service that ran along the current ’30’ route from Fawdon into Newcastle. then along Durham Road into Low Fell. 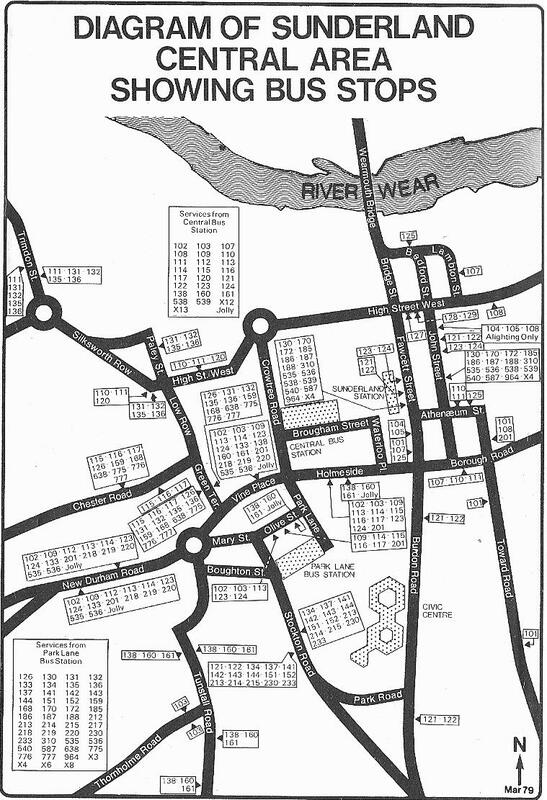 The 26 terminated at the Queen Elizabeth Hospital and operated, what was once the ’92’ route (then the M31/M32), via Church Road and Wynbury Road. And the ’27’ operated via Beacon Lough Road and Easedale Gardens into Wrekenton. 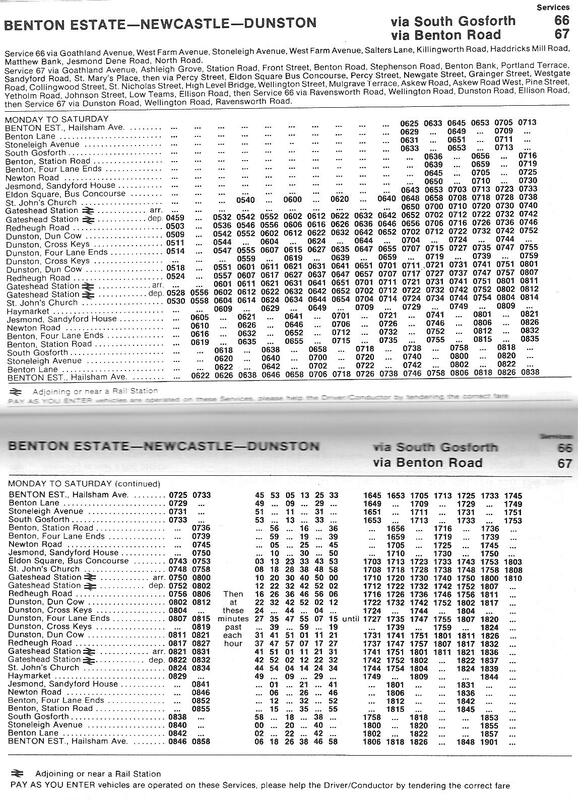 I was going to post these old inter conurbation routes between Newcastle and Gateshead in some sort of order. 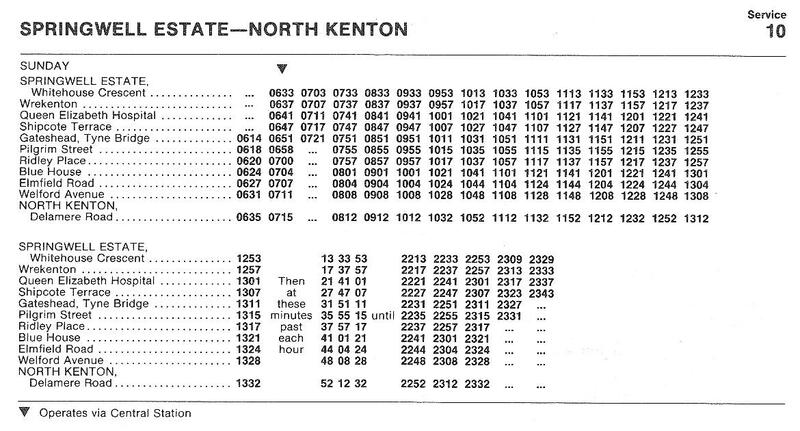 But it dawned on me after posting the 24/25 timetable that the ’10’ was indeed operational in 1979. 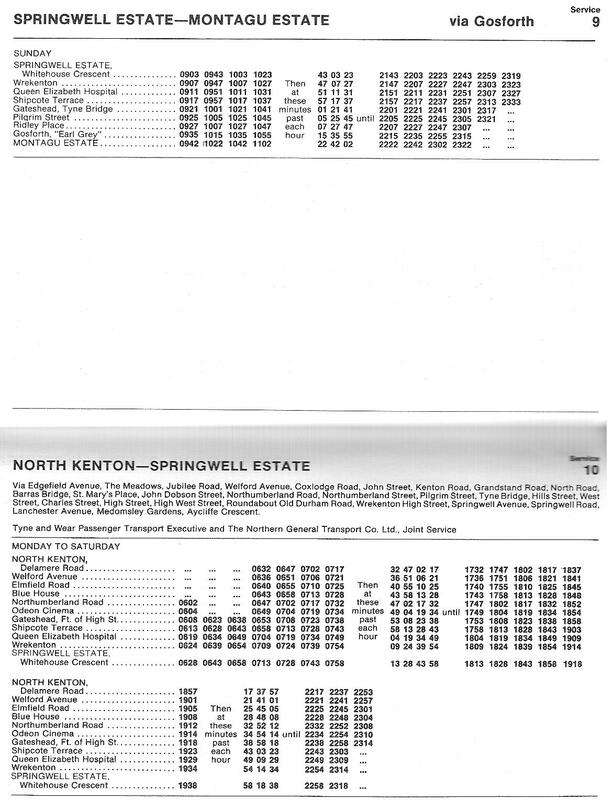 All services are operated jointly by PTE and Northern. The ‘8’ more or less operates the same route as either the 15 or 15A (I can’t remember) does now between Newcastle and Kenton Bar Estate. 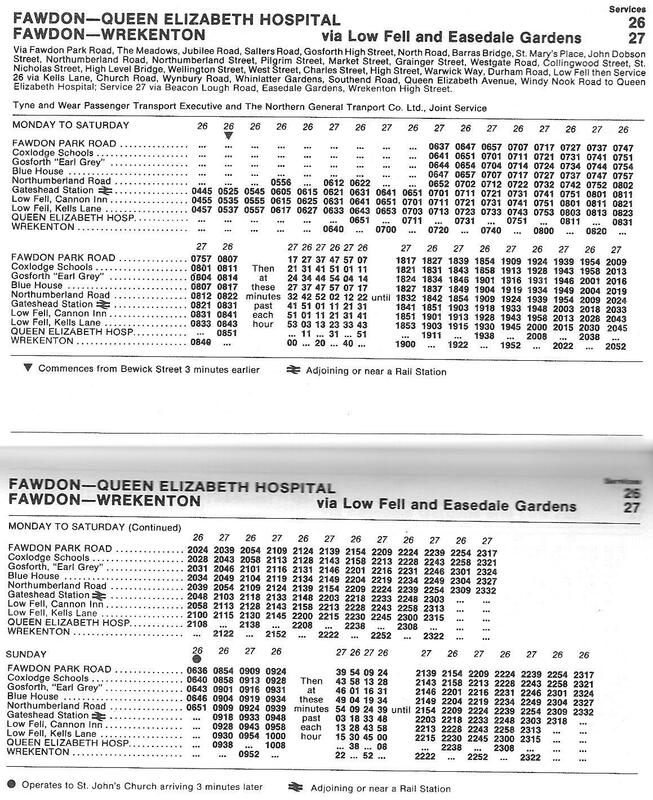 It then operates via the current ‘Fab 57’ route to Fewster Square where it terminates. 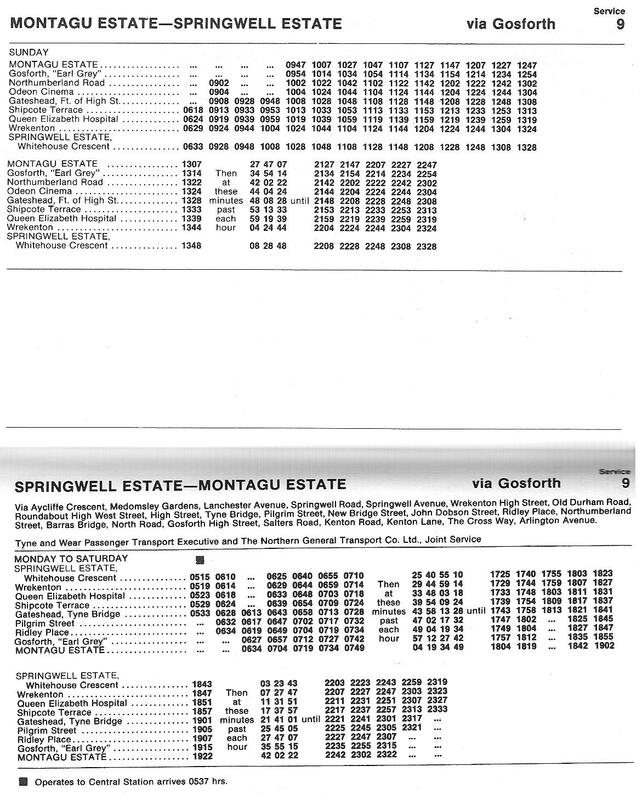 The ‘9’ operates via the current 31 route between Montagu Estate and Newcastle then the ‘Fab 56’ route to Springwell Estate. 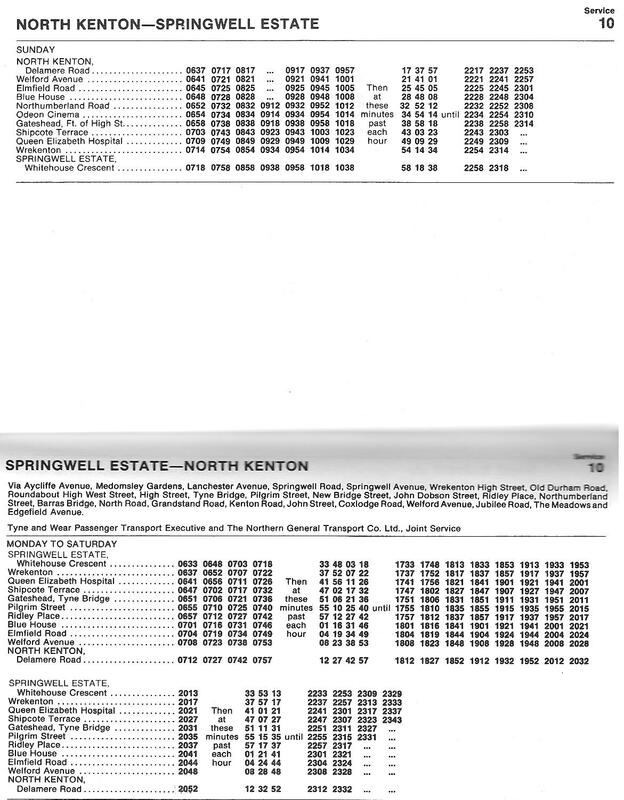 The ’10’ operates similar to its current route between North Kenton and Town (except it goes via Great North Road instead of Claremont Road) then, like the ‘9’ operates along the current ‘Fab 56’ route to Springwell Estate. Another ‘Cross-Tyne’ service between Newcastle and Gateshead. 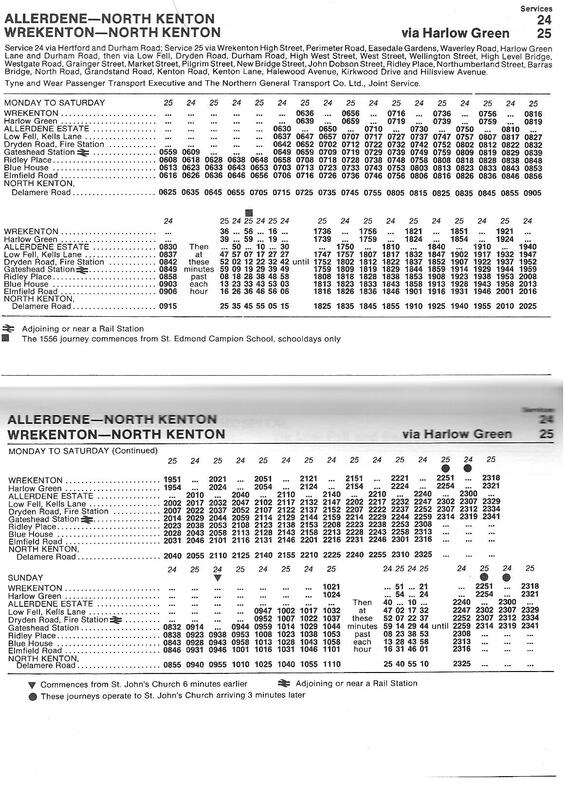 The 24/25 started in North Kenton and followed more or less the same route between North Kenton and Grainger Street as the 10/11 do now (before they were diverted to serve the University and RVI). When they got to Gateshead, they followed the classic 24/25 routes to their respective destinations before they were merged into one 24 service and then absorbed into the Coaster-branded ‘2’. 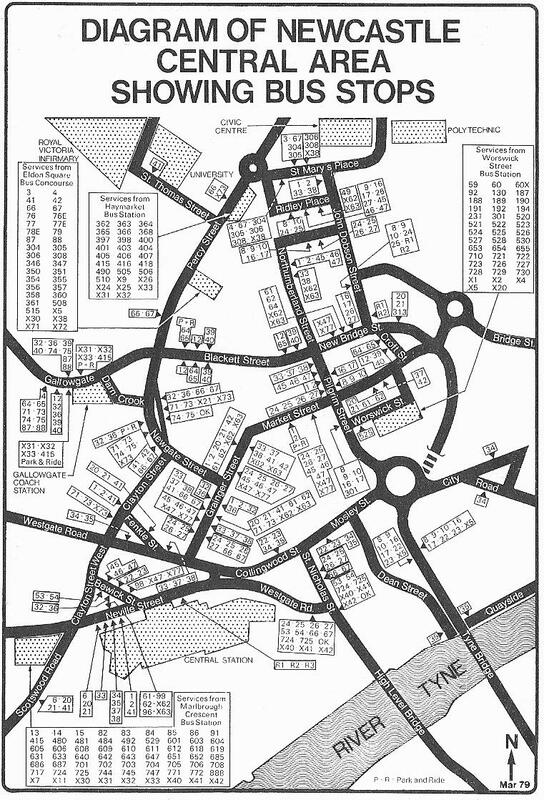 Before the Metro was built, cross tyne services between the suburbs of Newcastle and Gateshead were the norm rather than the exception they are today. 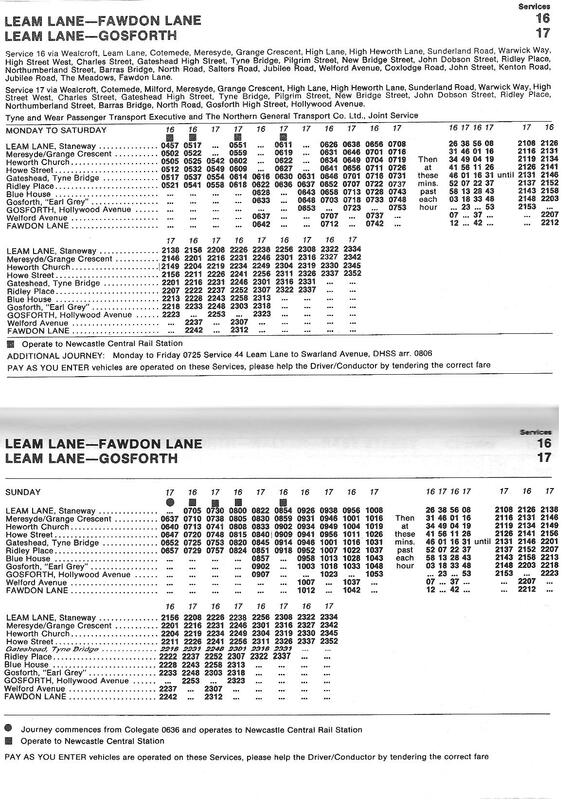 Here is an example of a service operating between Leam Lane Estate (Staneway/Woodburn) and Fawdon Lane (16) and Hollywood Avenue in Gosforth (17) via Heworth (before the interchange), Sunderland Road & Great North Road. These service were operated jointly by the PTE (now Stagecoach Newcastle) and Northern. 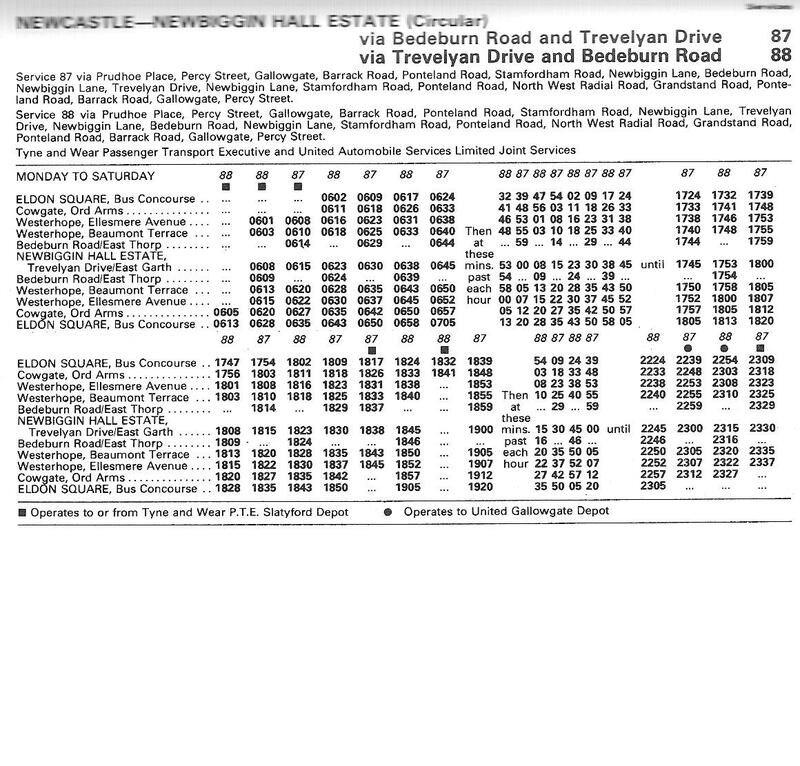 One more express service before moving on to some of the regular services in this 1979 edition of the Tyne & Wear PTE bus timetable. 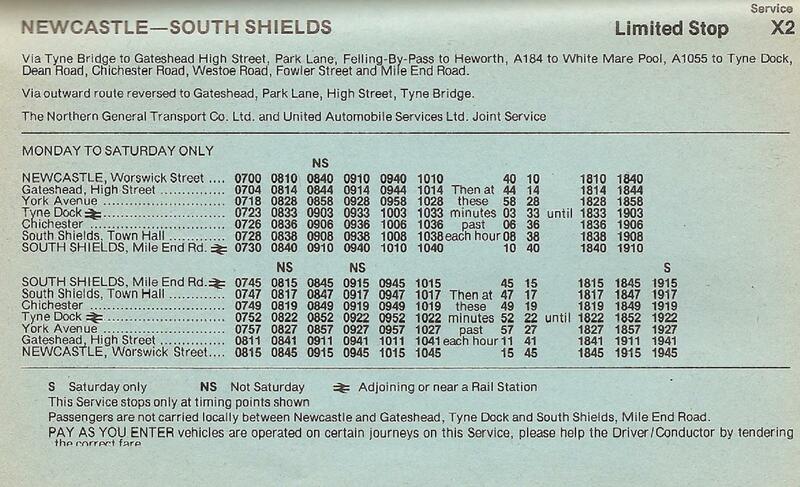 This is an example of how buses used to compete with British Rail to destinations within Tyne & Wear. The ‘X2’ ran between Newcastle and South Shields direct along the Felling-by-pass to White Mare Pool then up the A194 to Tyne Dock, through Chichester and into South Shields. The journey took just 30 MINS!. 2 minutes less than the train (or Metro as it is now). I wonder if it ever kept to that timetable – a feat which would almost seem impossible now. 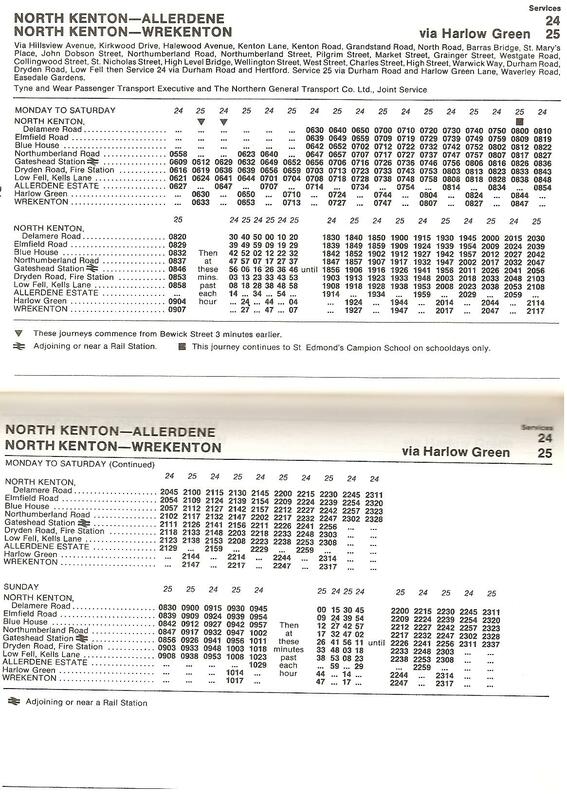 Another little observation about this services was that it was jointly operated by United (Now Arriva North East) and Northern. This must have been one the last United services ever to grace South Shields with its presence.